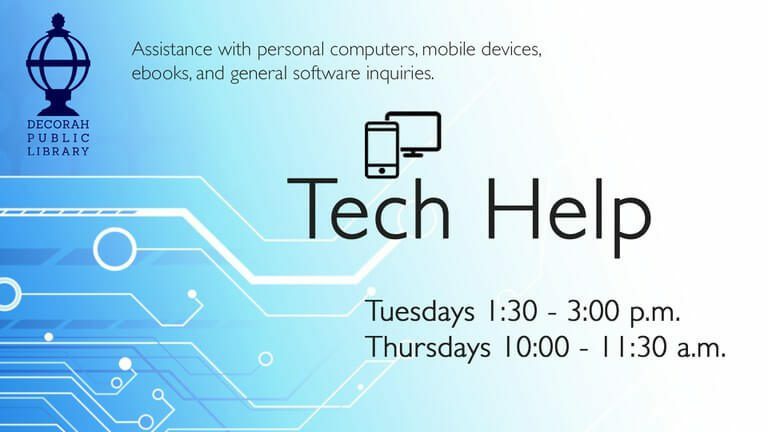 Held every Tuesday & Thursday. Registration is required for this event. Please use form below to register. 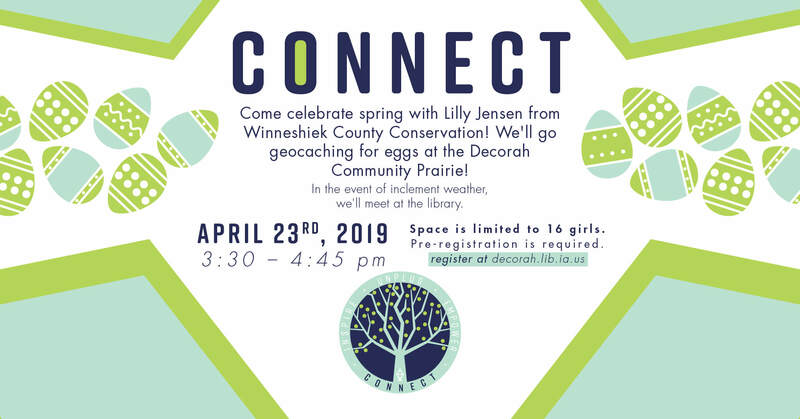 Come celebrate spring with Lilly Jensen from Winneshiek County Conservation! 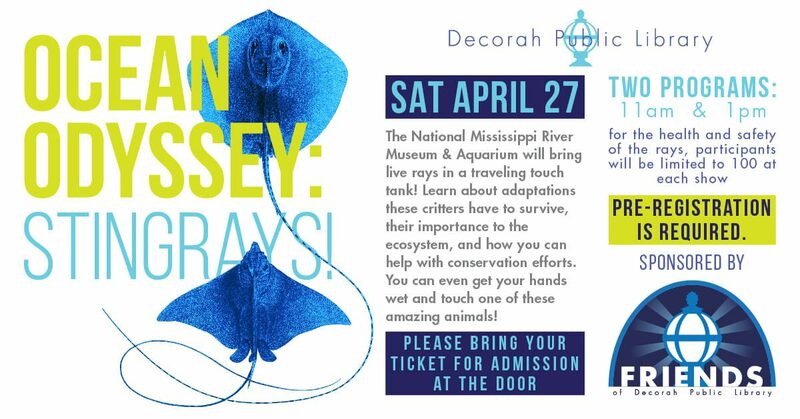 We’ll go geocaching for Easter Eggs at the Decorah Community Prairie! 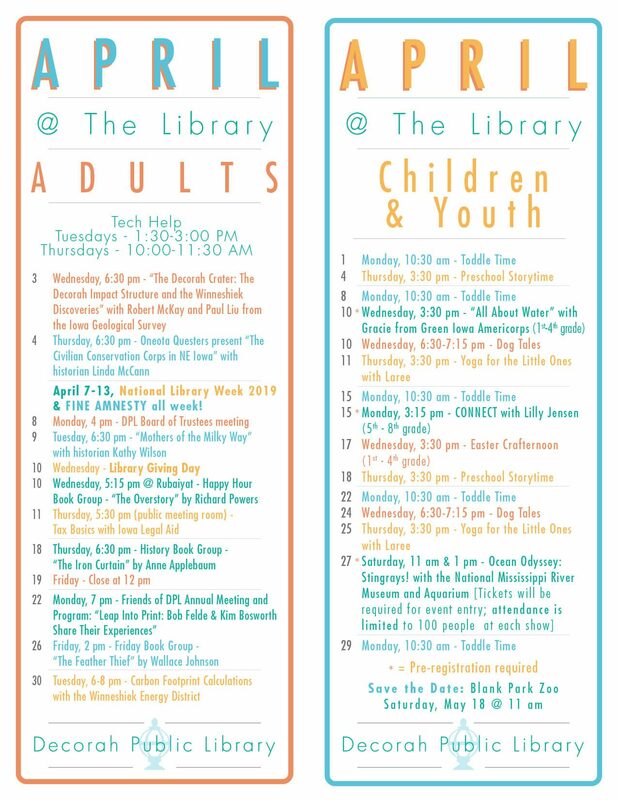 In the event of inclement weather, we’ll meet at the library to naturally dye eggs. For girls in 5th – 8th grade. First and last name of person/s attending the event. Seperate multiple names with a comma. 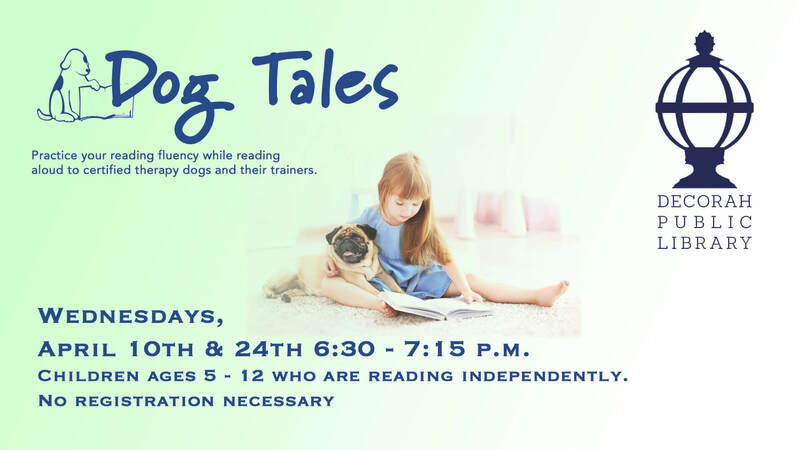 Children ages 5-12 who are reading independently are invited to practice reading fluency while reading aloud to certified therapy dogs and their trainers. 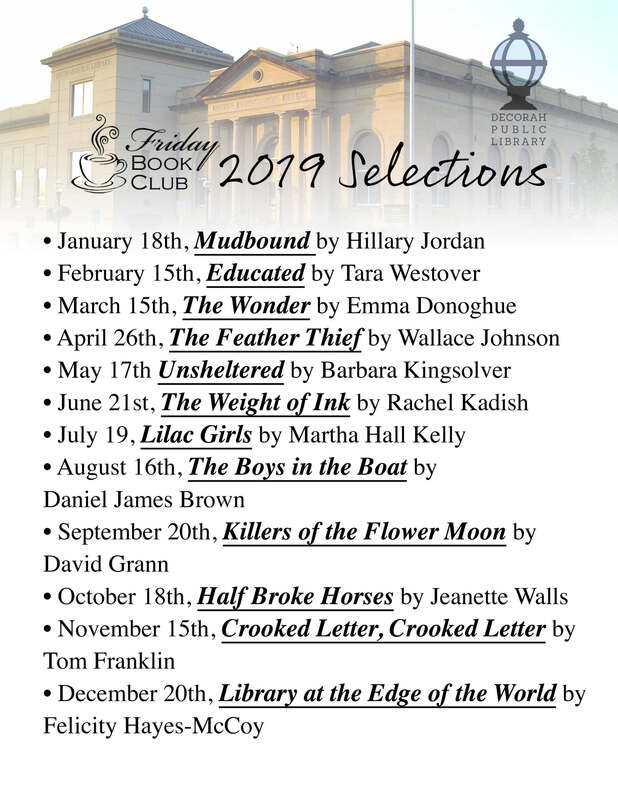 The Friday Book Group will meet at 2:00 p.m. Fri. April 26th on the 2nd floor of the library to discuss Kirk Wallace Johnson’s “The Feather Thief.” In June 2009, twenty-year-old Edwin Rist went to the Natural History Museum at Tring and stole hundreds of rare bird skins whose feathers were worth staggering amounts of money to those who shared his obsession: the Victorian art of salmon fly-tying. 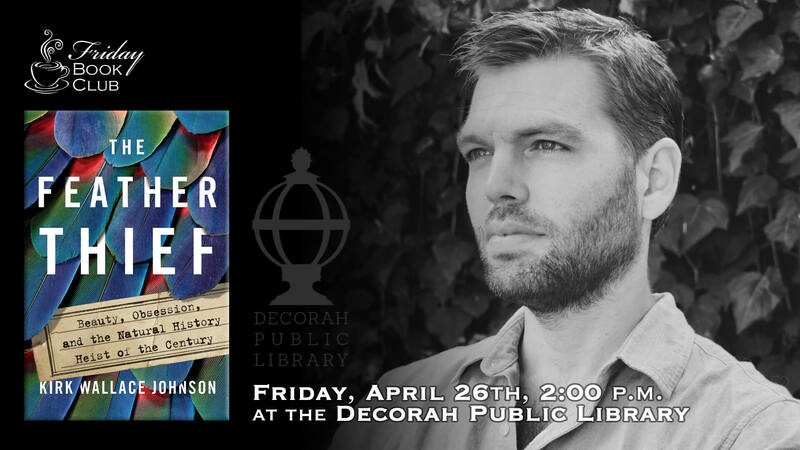 Two years later, Kirk Wallace Johnson learned about the heist and was soon consumed by the strange case of the feather thief. What would possess a person to steal dead birds? Had Edwin paid the price for his crime? What became of the missing skins? In his search for answers, Johnson was catapulted into a years-long, worldwide investigation. 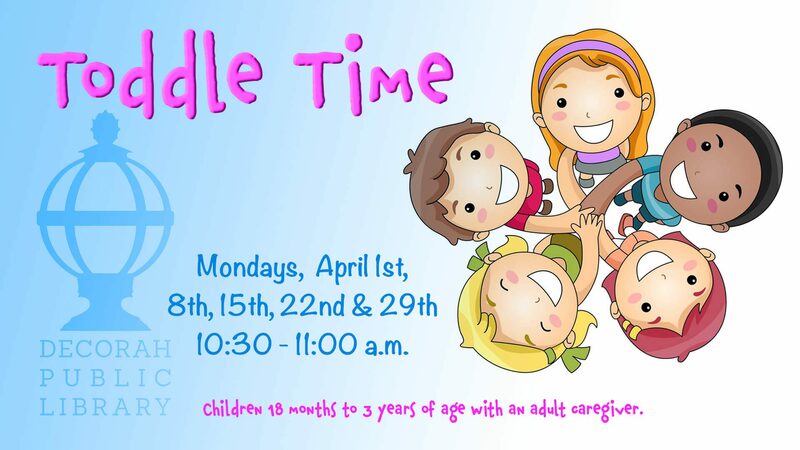 This program is offered at two different times. 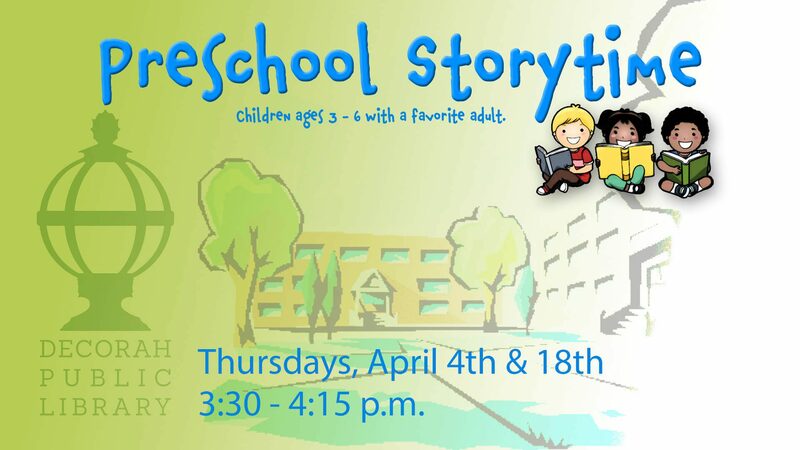 Please be sure to register for the correct session. For the health and safety of the rays participants will be limited to 100 at each show. Due to show limits we will not be able to accommodate session changes. Register for the 11 AM showtime below. Register for the 1 PM showtime below. Are you increasingly worried about climate change, and ready to do something? 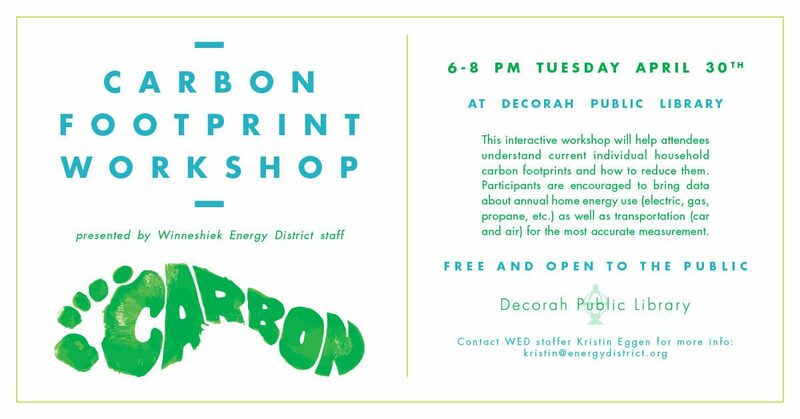 Join Winneshiek Energy District staff from 6-8 pm Tues. April 30 at Decorah Public Library for a free interactive workshop that will help attendees understand current individual impacts and how to reduce them. The first half of the workshop will focus on measuring the carbon footprint of an individual household. Workshop participants are encouraged to bring data about annual home energy use (electric, gas, propane, etc.) as well as transportation (car and air) for the most accurate measurement. The second half of the workshop will provide practical guidance about how to reduce a household’s carbon footprint, as well as effective and important advocacy opportunities. 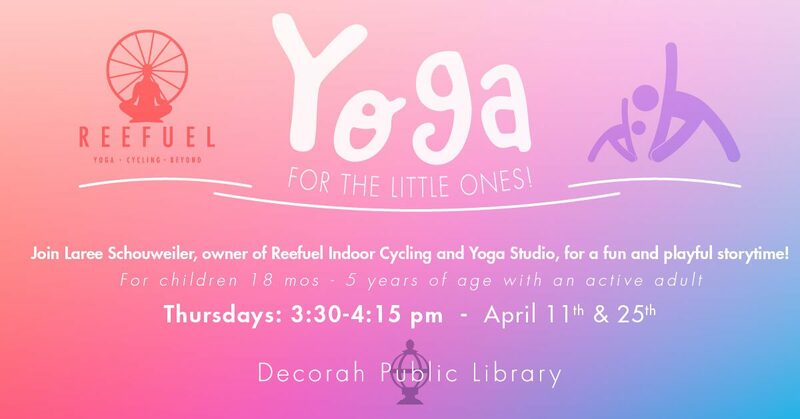 For more information, contact Kristin Eggen at kristin@energydistrict.org or 563-382-4207 ext. 4.